MidwayUSA, a catalog and Internet retailer offering Just About Everything℠ for Shooting, Reloading, Gunsmithing and Hunting, is excited to announce the launch of the new, official MidwayUSA Facebook page and Twitter feed. MidwayUSA will share this content through postings, videos and pictures. application. 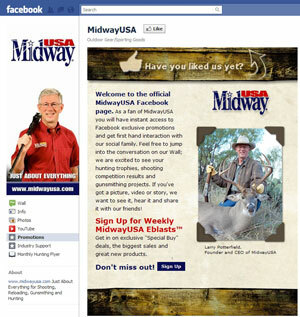 MidwayUSA will also communicate exclusive promotions, special offers and product information to Twitter followers. To find MidwayUSA on Facebook, please visit www.facebook.com/pages/MidwayUSA/182201421837454. To follow MidwayUSA on Twitter, please visit www.twitter.com/midwayusa. To find MidwayUSA on YouTube, please visit www.youtube.com/midwayusa.